This eLearning module looks at risk management, firstly from a wide perspective and then at foreign exchange, commodity and interest rate risk. Some of the instruments available to treasurers are also investigated. The Risk management eLearning course is suitable for anyone who is new to treasury or looking for high-level introduction that will help develop an understanding of the purpose treasury within the context of business. IS FINANCIAL RISK MANAGEMENT TRAINING RIGHT FOR YOU? 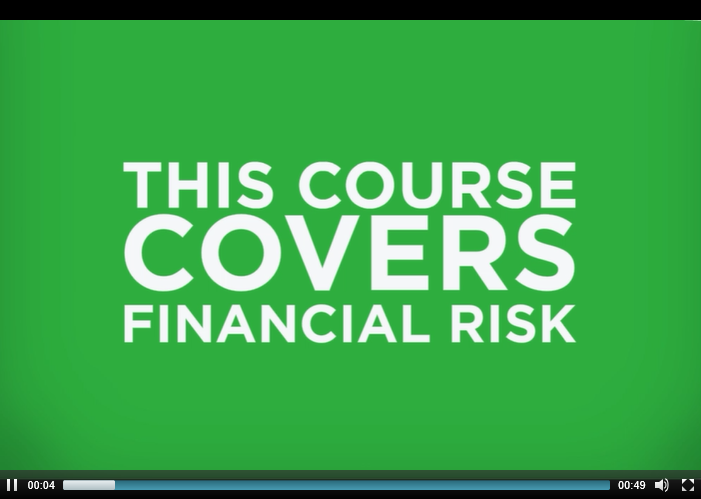 HOW DOES THE FINANCIAL RISK MANAGEMENT COURSE WORK? Our risk management eLearning course will take approximately 90 minutes and you have 90 days to complete this course from the date of purchase. The online format lets you build your understanding of risk management in bite-sized modules, providing great flexibility in the way you learn. You do not have to complete the course in one session and can tackle each topic at your own pace. All you’ll need to get going on this course is a laptop, desktop or tablet and a broadband connection. Risk management can be taken on it's own, as a standalone module if you're looking to quickly get up to speed on how treasury should operate in the context of a business. You can also take this course as part of the full eLearning series. You can now purchase an annual licence for our entire eLearning series for just £650. Buy the series now or if you have a group of 10 or more and are interested in buying multiple licenses, please email Client Solutions.